Created in partnership with Lowe’s, this annual event is held during the weeks leading up to Mother’s Day, and spotlights the home ownership challenges faced by women. More than 117,000 women from all 50 states have volunteered at past Habitat Women Build week events! No construction experience is necessary, but Lowe’s free, one-hour class, “How to Use Power Tools Safely,” is scheduled for Saturday, April 21, at 10:00 am at our local Lowe’s: 3458 Zafarano Drive, Santa Fe, NM 87507. Please join us if you can. No sign-up necessary for this class! To volunteer for the Women Build project as an individual, please register using our Volunteer Calendar. To register as a group, please call Sophia Barnett directly at (505) 986 5880 Ext. 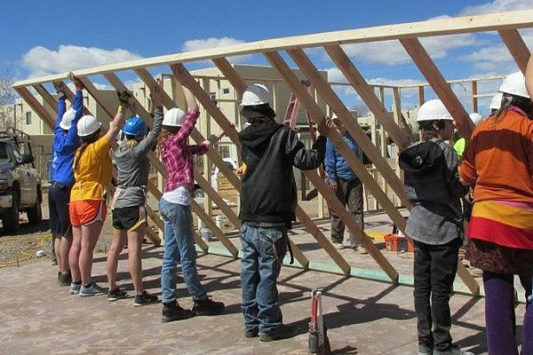 102, or email sophia@santafehabitat.org.